Haven’t decided on a hotel yet? You can look at other available hotels in the regions of Estremadura, Ribatejo, and Lisbon with Booking.com. Everybody comes to Lisbon. It’s old fashioned yet fun, architecturally a throw back to another century yet showing definite signs of new found prosperity. Phoenicians, Romans, and Moors were merely the opening act to Lisbon’s glory during the Age of Exploration when riches poured in and extravagance found an outlet in a great building boom. A massive earthquake in 1755 devastated the city. Not until the late 20th century has Lisbon’s fortunes been once again on the upswing. 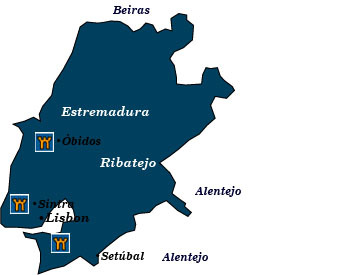 North of Lisbon stretch the two narrow provinces of Estremadura and Ribatejo. You may take easy day trips from Lisbon to visit the outstanding sights, or better yet, spend a few nights away. Some of Portugal’s best castle hotels are just an hour away. Lisbon Castle lovers should head to the Alfama, the revitalized Moorish district topped by the Castelo de São Jorge. This Moorish fort was built on the site of a 5th-century Visigoth fort. It features ramparts, towers, and the ruins of a palace that was a residence of the Portuguese kings prior to the 16th century. Two other neighborhoods worthy of a stroll are Bairro Alto, known for its fashionable 17th-century homes, and the Baixa, which is the heart of Lisbon. The district of Belém is home to some of Lisbon’s grandest monuments and the launching point of Portugal’s great explorers during the Age of Discovery. The Mosteiro dos Jerónimos is one such famous monastery financed by the riches of these expeditions, and a superb example of Portugal’s unique Manueline architectural style. Hardy museum goers should have a look at the outstanding cultural treasures at the Museu Calouste Gulbenkian, one man’s extraordinary collection of ancient and European art; the Museu Nacional de Arte Antiga, which is housed in a 17th-century palace and features an admirable collection of Portuguese art; and the off-the-beaten-path Museu Nacional do Azulejo, a wonderful museum housed in a convent that is devoted to the art of azulejo tiles. Sintra Spectacular views, lush green surroundings, and exquisite palaces make Sintra one of Portugal’s top destinations and a UNESCO World Heritage Site. The magnificent Palácio Nacional de Sintra boasts eight centuries of history from its Moorish origins to the fall of the monarchy in 1910 and a superb collection of decorative art from the Manueline period. Surrounded by a delightful park, the Palácio Nacional da Pena presents a fanciful architectural extravaganza like an over-the-top wedding cake. For outstanding views climb up to the ruins of the Castelo dos Mouros, a Moorish castle captured by Afonso Henriques in the 12th century. In the surrounding area, the Parque Natural de Sintra-Cascais is home to exotic plant species, lush terrain, and the rugged coastline of Europe’s most westerly point. Cascais This lively beach resort was once a summer destination for the royal court. In addition to its seaside attractions is the charming Museu Condes de Castro Guimarães, a 19th-century mansion that gives an excellent insight into a once-noble lifestyle. Queluz The pink-toned Palácio de Queluz was once a summer residence for the royal family and a fine example of Portuguese rococo architecture. One wing of the palace is still used to accommodate state guests; another wing is a luxury pousada. Mafra The Mafra National Palace is part baroque and neo-classical palace, basilica, and monastery. Its 880 halls and rooms were built with no expense spared, so much, in fact, the country’s economy was destroyed as a result. The royal family briefly lived here before they fled to Brazil. The Castle at Sesimbra A steep climb takes you up to this 12th-century castle overlooking the harbor of Sesimbra. Alcobaça A UNESCO World Heritage Site, the 12th-century Cisterian abbey is an architectural masterpiece. Castelo de Leiria Captured from the Moors in 1135 by Afonso Henriques, this splendidly situated hilltop castle was once a royal residence for King Dinis. Batalha A UNESCO World Heritage Site, the Mosteiro de Santa Maria da Vitória in Batalha is an outstanding blend of flamboyant Gothic and Manueline architectural styles. Óbidos A perimeter wall, flanked by small towers and massive bastions have protected this fortified medieval town for centuries. Óbidos is also home to a castle, now a luxury pousada. Fátima It was here in 1917 that three shepherd children claimed they saw an apparition of the Virgin. Over 4 million pilgrims a year come to pay respect to the Shrine of Our Lady of Fátima. Castelo de Almourol The Knights Templar built this picturesque castle in the 12th century on the site of a Roman fort. Tomar A UNESCO World Heritage Site, the magnificent castle and massive hilltop Convento de Cristo was once the former headquarters of the Knights Templar. The charming town below holds Portugal’s oldest surviving synagogue.